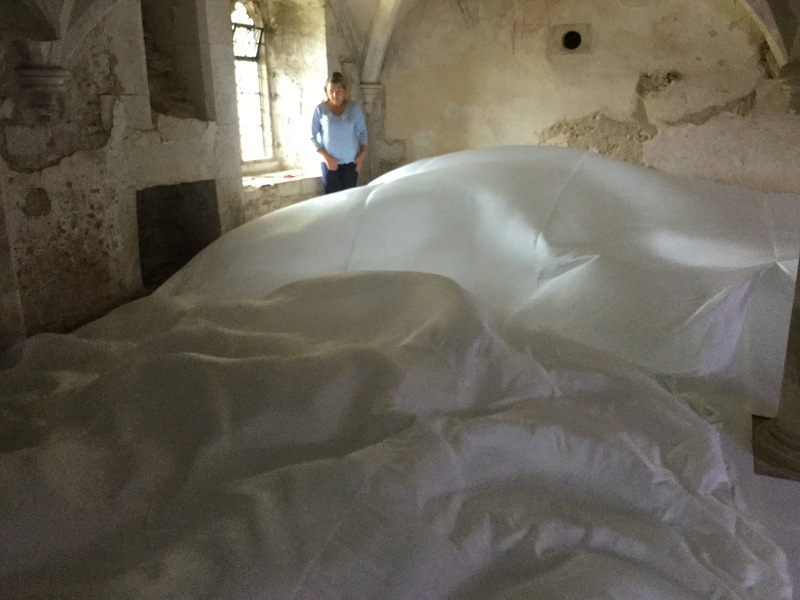 Last week-end we began the set up of The Ripple Effect – the installation we are creating for the Chaplains’ Room at Lacock. After weeks of planning and testing it was great to be at the point of bringing it all together. The idea in itself is quite simple, but it has taken a few trials and errors with different fabrics and fans to get to this point. We did a test earlier in the summer, but it wasn’t with a full size piece of fabric so we were not totally sure on how the floor, the stone pillar and the air circulation would affect the overall movement and flow of the silk. The Chaplains’ Room is also quite damp, so the weight of the silk will change throughout the day; small variations, but they still will have an effect on the overall movement and flow. The silk was made up to be oversized in length so that we could see the effect of the silk in the space and adjust it on site. It was quite a thrilling moment when we switched on the fans for the first time and the air rippled beneath the silk. At that point the silk was laid out at its longest length and the result was quite spectacular – huge billowing waves. Most of the fabric was pre-sewn except the area where the central stone pillar is. This had to be cut out and hand sewn around the pillar. The effect of the pillar is similar to a boulder in a river; the movement of the silk flows past the pillar like water around a rock, with the area behind the pillar remaining much calmer. Lacock is known for being the birthplace of British photography. William Henry Fox Talbot and his family lived in the abbey and the layout of the space is similar to the one today. The Talbots’s remodelled the South Gallery, including the window which William captured in his first photographic negative in August 1835. During our visits to Lacock we have had the opportunity to see the site at different times of the day. These images are some of our observations on how light falls and leaves it mark on the fabric and artefacts of Lacock. Every visit to Lacock reveals something different. The Cloisters are full of marks and traces which give clues to how people used and occupied the space. For instance each Stonemason carved their signature into the stone to identify their work and to serve as a proof of build to ensure that they were correctly paid. The chip marks in this stonework were there in order to provide a hold for the plaster. The Chaplains’ Room which is at the end of the South Cloister has traces of medieval wall paintings and monastic graffiti. The one of the rabbit scratched into the plaster works looks like it could have been done yesterday! The grafitti below reads ‘JOHAN fecit hoe’ meaning ‘John did this’ and is attributed to one of the Chaplains. The material used for the wall is limestone rubble and plaster which is made from slaked lime and alluvial shale. In the south-west corner of the Cloisters, just outside the Chaplains’ Room is a stairway which was used by the Abbess to go to and from her apartments to the Cloisters and Abbey Church. A little way up the stairway is the Abbess’ ‘squint’. 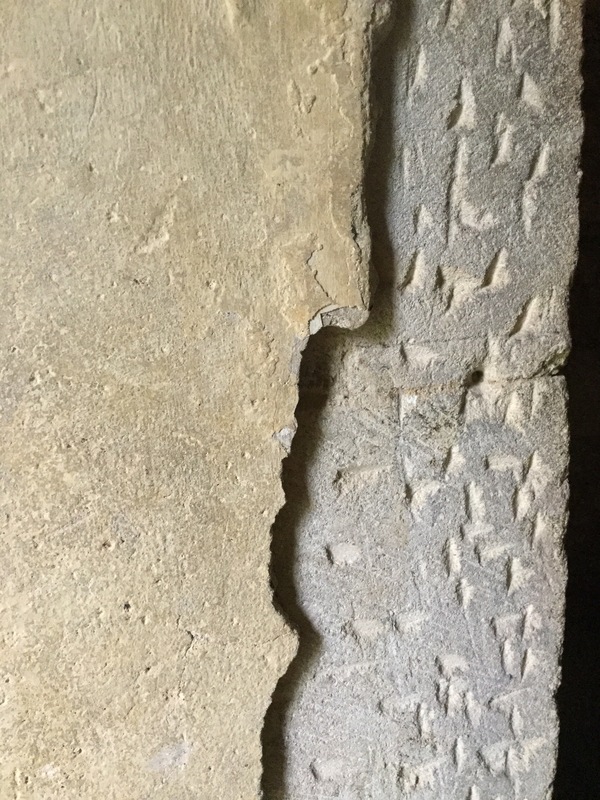 This is a small section of masonry which has been removed from the vaulting and which enabled the Abbess to look through and ‘observe’ the Nuns. On one of our visits we were shown around inside the Tudor building and taken to the Clock Tower. The space inside smelt warm and woody and outside through the windows we could hear the swifts calling. We were shown burn marks in the beams which had been deliberately made by holding a lit candle up to scorch the wood. Their purpose was to act as sympathetic magic to ward off malignant or accidental fires. It is unclear just how much of the pseudo-theology behind these marks was understood by the people who made them. They may have represented ‘good luck’, protection from ‘bad luck’ or simply the power to deter witches. The mechanism of the clock. It is a long-held tradition to set the clock 5 minutes fast! The tour through the roof space was rewarded by the winding of the clock which occurs once a week. It has been a long-held tradition that the clock is set 5 minutes fast with the hope that the residents of Lacock village will always be on time. The National Trust tea shop however does not observe the ‘Lacock’ time! Over the summer we have been working on a new project for National Trust’s Lacock Abbey in Wiltshire, which explores the theme of Peace within the context of this unique site. Lacock was founded as a nunnery by Lady Ela, the Countess of Salisbury, one of the most powerful women of the Middle Ages, and was a place for contemplation for 300 years. We are interested in making connections with this legacy and finding out from the people who work and visit here what peace means to them from a contemporary perspective. Over the summer we have been visiting Lacock to talk to staff and volunteers to find out their thoughts and undertake further research for the installation we are creating. We will be making a temporary piece of work for the Chaplains’ Room which is situated off the south-west corner of the cloister. It will involve creating a floating silk floor made to fit the shape of the Chaplains’ Room. The silk floor will be raised off the ground beneath which a series of fans will be placed causing the entire area to flow with undulating ripples. A section of the floor which will be left uncovered to allow enough room for people to enter the room and immerse themselves in the installation. A combination of LED lighting and natural light will illuminate the space and rippling silk. A soundscape developed from sounds recorded from around Lacock will add to this immersive experience. The installation coincides with the centenary anniversary of Armistice Day and the silk picks up on these associations and its use in times of conflict and peace during both World Wars. Armistice Silk – a re-finished silk made from the 18 million yards of surplus silk cartridge cloth at the end of World War 1 and the silk military parachutes, were both used to make clothes during and after the wars. The seed for our initial idea grew out of our observations of the spaces around the cloisters and the way in which time has left its mark on the fabric of the building. There is a sense that people have passed through the space and the building seems to gently hold a residue of the life that has flowed through it. There is an atmosphere that becomes apparent when entering Lacock that time slows. The wave-like forms polished into some of the compacted mud floors seem to express this. For us, when visiting Lacock, there is a tangible feeling that we have become part of the tradition of people drawn to this place of contemplation. The nature of the pillar and arches in the Chaplains’ Room convey a sense of having sunk down into the layers of history and architecture. Our installation will pick up on this and create a space through which the slow and ancient erosion of the site can appear to flow like a time-lapse sequence. We have now finished making and installing the video installation Front Row within the window space of Booth Mansion on Watergate Street. We spent last Wednesday setting up the mirrored chamber and blacking out the windows to create a central view into the installation. The installation will be switched on during the day from 7-10th September and will be shown as part of the Open Heritage week-end. The film projection has been created from film footage and photographs taken of the Rows which have been edited and layered to create a constantly changing kaleidoscopic view of these spaces. The film is looped to run continuously throughout the day and the mirrors are set to both reflect the projections and the real-time space of the Rows. Over the years the Rows have changed and adapted either through accident or by design with each architectural feature reflecting a function, incident or story of the past. The Rows today are living, working spaces and continue to evolve and develop according to their usage and activity. We have created Front Row in response to the fragmentary and multi layered nature of the Rows and the potential of these unique spaces to adapt and evolve. In July we were appointed by Chester West and Chester and Chester Civic Trust to develop a temporary artwork for a public space along The Rows as part of the Heritage Open Days which runs between 7 – 10th September 2017. The history of the Chester Rows dates back to over 700 years and are of international importance containing the UK’s best collection of prestigious town houses from different periods all in one place. The Rows provide a raised pedestrianized covered route past shops and residential properties offering the visitor a unique elevated view of the city, yet these Rows are often ignored by shoppers or visitors to the historic city. One of the aims of this project is to encourage more activity and draw people up onto these amazing spaces and reveal some of the hidden stories connected with the Rows. In developing an idea for this commission we have been undertaking research at Cheshire West Museums and with the assistance of Cheshire Archive and Local Studies team in Chester to unearth stories connected with the Rows. This research has coincided with a hunt for spaces along the Rows which we could possibly use for the duration of the festival which has taken the ideas in some interesting directions and occasionally up some blind alleys! Our installation for the Amy Johnson Festival now has the title ‘Strange Attractor’ and will be made up of the following elements; a magnetic pendulum, a large disk of sand with three magnetic points, three colour changing circles of light. The magnetic pendulum will swing in an arc across a large disk of white sand onto which three circles of continuously changing coloured light are projected. These circles will overlap each other to form a central section of white light under which three magnetic centres exert an invisible force. Below are some of the colour combinations that are created when the colours mix – the greys and neutral colours are particularly compelling. The pendulum cuts a fine pattern in the sand tracing its various journeys towards equilibrium and the calm elliptical spiral at the centre. The magnets however, exert a strange attraction and bring a degree of uncertainty to the airspace and the exact direction that will be taken. Occasionally the pendulum completely changes direction and can even become stranded at a magnetic pole. We have set up a pendulum in order to work out exactly the weight, length, and magnet positions we want to use. We were curious to see in more detail how the pendulum makes its way towards the centre of the circle. The images below have been taken in the dark with a small light attached to the end of the pendulum. These are photographic exposures of about 5 minutes each to show the extraordinarily beautiful paths of movement of the pendulum as it circles towards equilibrium. The journeys start from the outside where the pattern is forms a series of ordered and slightly shifting ellipses of slowly reducing size. As the pendulum comes into the influence of the three magnets which are placed at 120 degree intervals around a 600 mm diameter circle, the patterns becomes chaotic, occasionally changing direction of rotation. The pendulum finally reaches a second state of order as it moves towards the centre away from magnetic influence. Here the pattern becomes intricate and dense. Viewers will be invited to swing the pendulum and follow the flight as it passes through borders of colour, sandy terrain and magnetic atmosphere. As we have been working on this idea we have noticed the parallels and connections with flight and atmosphere. For example the tip of the pendulum actually describes a path of travel that follows the inside surface of a sphere, and the magnets suggest planetary forces. Strange Attractor is a wonderfully ambiguous term which can refer not just to chaos theory and the ‘butterfly effect’ explored by the mathematician Edward Lorenz (https://en.wikipedia.org/wiki/Lorenz_system) but also our fascination with light, material and pattern amidst the compelling uncertainty of elemental forces. Art and science have a natural overlap as they are both functions of our interpretation and understanding of the universe and the world we live in.